It's been 3 years, 10 months and 7 days since I left Chicago and since that time I have been dreaming about the day I can go eat gam pong gi (Korean chicken wings) at Great Seas again. Well ladies and gents, the time has finally come. Susan, Aleen and I took public transportation to go to Great Seas last weekend from downtown, which took us about 40 minutes. That is what I call dedication. It's basically on the last stop on the Brown Line at the Kimball stop. Once you step out of the station, you end up on Lawrence Avenue and it's a short walk to your right. You'll see a yellow sign with black and red lettering in Chinese. LA is the land of Chinese-Korean restaurants and while I've had my share of gam pong gi in LA, it just does not compare to Great Seas. I've given up in trying to find a replacement for it in LA. So you can imagine my excitement when I knew I'd be in the land of gam pong gi again. Most gam pong gi places in LA use pieces of fried, boneless chicken, but here, they cut the wings to make it look like round, chicken lollipops. The sauce is just the perfect blend of spicy and sweet too. Their jjajangmyun (black bean noodles)and jjampong (spicy seafood noodle soup) are alright. I wouldn't come here specifically to eat the noodles, but it's nice to have dietary diversity and share a bunch of plates with your friends. I forgot to take pics of the jjajangmyun, but here's the jjampong. I was a huge fan of their mapo tofu from before, but it didn't have the same power over me this time. It was a bit too spicy (our fault since we said we wanted it so). I'll give it another try next time. They also will post up a picture of you on their wall if you eat the most number of chicken wings. I think the current record is 86 wings. That's a little nuts. Adam Richman from Man v. Food needs to come here and try to top that. The wings have a lingering kick, so I give mad props to whoever ate 86 wings. I was drinking tons of water (as usual) to compensate. FYI for you die-hard Great Seas fans. Great Seas' daughter opened a franchise called Take Me Out where they are serving the same Great Seas lollipop chicken wings, aka "little hotties", in Pilsen, which I think is closer to downtown. We shall have to make the trek out there next time. i love love great seas' gang poong gi. 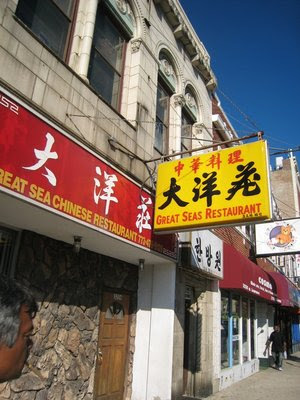 it's the best anywhere.. i think great beijing in chicago has bomb-diggity jjang gang myun. Ooh, thanks for the recommendation. I'll def have to check it out. I can't wait to see you when you come in August! !